I don’t remember how I came to learn about Superman. We didn’t have a TV in the house. The radio was closely guarded to monitor everything that might enter my little mind. I remember when I was about 5-years old, running around with a towel tied around my shoulders, my arms outstretched, making zo-o-o-ming noises, pretending I could fly. In my mind I was flying. My mother read to us every day. Stories of heroes in the Bible who did amazing feats for God. Stories of animals that could talk – The Old Homestead Tales. I learned the joy in placing myself inside those stories. And the freedom found in directed pretending, or fantasy. Years later when I first saw Christopher Reeve in the TV Superman show, I was hooked. I knew it was pretend. But, what a great pretend it was! But adults seem to lose the skills of imagination, of creating events and abilities that include going beyond the literal world. The literal world seems to empty the brain of dreams and goals that reach beyond the facts of life in the right now. My family was quite pragmatic. This is life; accept it and be happy, or at least be content. Other than the Future as painted in the Bible, don’t expect much from this life. I was in my thirties when a friend introduced me to some revolutionary books. The Power of Positive Thinking by Norman Vincent Peale, and Think and Grow Rich by Napoleon Hill. I learned that I did not have to accept right-now-life as the only option. Within my mind was power that I had never dreamed of having. It took me back to my childhood times when I could be anyone I wanted to pretend to be. But now, some respected authors told me that “content” was not my only choice. I could change my life into whatever I dreamed for myself. 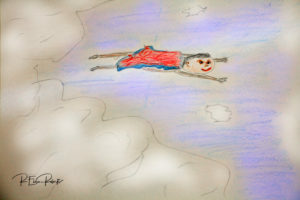 Not Superman, of course, but dreaming of a life of abundance was okay for adults. I read and re-read those books. I bought every “positive thinking” book I could find. Super Powers were within reach for anyone, everyone who would choose to awaken them. Superman, Ironman, X-men – they are all make-believe, pretend. But I have, and You have, true super powers. 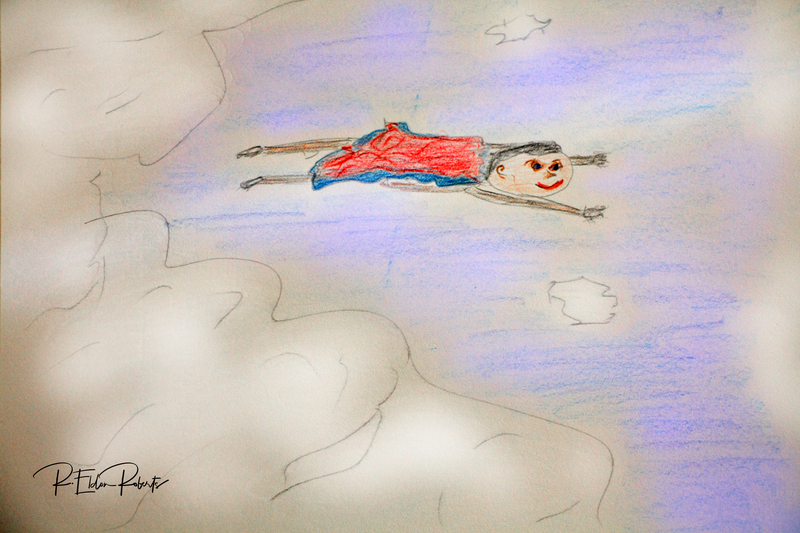 When Superman was growing up and first learned that he had the power to fly, he had to learn how to use that skill. He couldn’t just automatically fly like a bird or a plane. He crashed into things a few times – maybe a lot of times. He made mistakes. He messed up. That didn’t mean he wasn’t Superman. New skills will take you some time to perfect. Practice. Crash. Practice some more. Repeat until the skills are smooth, natural. Look! In the mirror! It’s not a bird or a plane… It’s Super You! You’re a published, successful writer. You’re a counselor to thousands, sharing the secrets of wealth, influence, happy, healthy living. It’s your dream come to life! Whatever your dream is, inside your mind is the power to accomplish that dream. The name of the Central Power Controller is — Choice. Make a choice. That’s the first step. That step won’t immediately put you flying high in the clouds. But, without that step, Your Choice, the clouds will remain out of your reach. Choice reveals your Goal. What you want to achieve. Where you want to fly. I remember that my father was not accepting of my dreams. He told me more than once to get my head out of the clouds. You will have those friends, and maybe relatives, who give the same dream-beating advice; get out of the clouds. Let me emphasize, You have the power. Negative words cannot take away your choice, unless you allow them to. Choice is a God-given gift. Claim it and hold on to it. You probably suspected that there would be a ‘however’ appearing somewhere in this article. Here it is. However, Choice alone will not accomplish much. If Choice is alone, it probably will only serve to make you dis-satisfied. Fortunately, God knew what He was doing. He didn’t give us just one gift. A companion gift that He gave to each of us is commonly referred to as The Ability to Learn. With this gift you can gather knowledge to learn what you can about the Goal that is present in your Choice. He also gave us the gift of Effort. Do. Work. Strength. It goes by many names. Action is my favorite name for it. But, without Knowledge, Action is just a futile beating of the air. And without Action, Choice is nothing but a fleeting dream, an indistinct Goal that taunts you from an unreachable distance. Exercise your Choice, then gather Knowledge so that your Actions will be directed toward achieving your Goal. Keep your Choice, your Goal, in front of yourself at all times. Pictures, Words, Reminders of the Choices that you have made and of the Actions that you have taken toward your Goal. Your Choice, your Goal, and your Actions will combine to create in you Skills that make your efforts more effective, more successful. Which leads us to the next Gift: Persistence. Stick-to-it-iveness. This is the Missing Link in the story of those who fail to reach their goal. They gave up. They quit trying. Persistence involves forward thinking with backward evaluation. Keep the Goal in view while looking at what you’ve done. Evaluate the skills you’ve developed and used to see how they might need honing, up-dating, tweeking. If you can, find a Guide, a Mentor, a person who has achieved what you dream, that will travel this journey with you and offer counsel, then your Efforts will be more effective, and your journey more pleasant, and probably shorter. Make a Choice. Identify the Goal. Gather Knowledge about Achieving your Goal. Develop Skills that focus on your Goal. Your mind is “faster than a speeding bullet, more powerful than a locomotive,” and able to solve mammoth problems that appear to be like tall buildings. That’s You! Making use of your Super Power! I would love to hear from you. What books would you recommend? What steps would you add or subtract from this plan? Tell me about your experiences in achieving a goal. Previous PostPrevious Is Excellence a Choice?